What does a homerun, hospital and local shelter have to do with one another? Maybe not much at first glance. But, if you live in Wayne or surrounding counties, it means a lot. This past baseball season, a local high school baseball team had a little extra incentive for each home run completed – $50 to a local non-profit shelter. 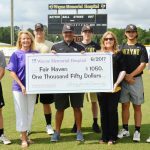 After a whopping 21 home runs in the Wayne County High School Varsity Baseball Team’s season, that home run tally equaled $1,050. Yesterday, representatives from all parties convened to make the gift official. Fair Haven is a 12-bed facility that focuses on giving victims of domestic violence a safe place to heal while providing the resources to begin a new life. If you or someone you love is a victim of domestic violence, call Fair Haven at 912-588-9999. If you would like to give of your time, talents or resources, you may also contact Fair Haven at fairhavenjesup.org. Wayne Memorial Hospital, whose mission is to provide high quality health care services to all patients, built a state-of-the-art facility in 2007. It is the third largest employer in Wayne County with 400 employees, 84 beds and is a two-time winner of the Georgia Alliance of Community Hospitals Small Hospital of the Year Award.